Every evening during the European meeting, Brother Alois gave a meditation at the end of the prayer. These meditations are published here. For each and every one of us, it is a joy to have arrived here and be together in this beautiful city of Valencia. Thank you to those who are welcoming us. This evening, I would like to thank them in Valencian: (speaking in Valencian) Thank you to the young and the not-so-young of the city and the region, thank you to the families and parishes, we are touched by the warmth of your hearts. On Saturday I arrived directly from Syria, where I spent Christmas. Previously I was in Lebanon, where I joined two of my brothers who have been there for two months. The Middle East is not far from us and what happens there has an impact on us in Europe. Everyone I met in Syria said: "Pray for us." Let us listen to their call and confide to God those who suffer violence in the Middle East. Let us carry within ourselves the poignant questions they ask: Why all this violence? Where is God? I spent Christmas in the Syrian city of Homs. The degree of destruction is unimaginable. Much of the city is in ruins. It is a ghost town. Some families are returning now and are trying to resettle in the ruins, with no water or electricity. In the center of Homs, before the ruined Greek Catholic cathedral, parishioners celebrated a Christmas party for the children. Some young people had prepared gifts. The children sang. I have rarely experienced a Christmas party where the Gospel message of peace was felt so strongly. At Christmas we remember that Jesus came to bear witness to the infinite mercy of God. Violence was unleashed against him, but it could not overcome his love. Today, all over the earth, new forms of distress, migratory, ecological, or social, are challenging the believers of the various religions and non-believers, and require new forms of solidarity. Without losing lucidity, but resisting fear, we would ask God : Show us how we can contribute without delay, near at hand and far away, to enable your peace to shine forth amidst humanity and in the whole creation..
What can we do when faced with conflicts? When they have already broken out, it is often too late. The spiral of hatred and revenge is extremely difficult to interrupt. The wounds are too deep for hearts to find peace. How much better to open our eyes to how conflicts are prepared? It is hearts that need to change. Peace must spring from a deep source. That source lies in the peace that God communicates to us. Yes, world peace begins in the heart. During these days in Valencia, and throughout the coming year, we will seek together how to awaken in us the courage of mercy. For that five concrete proposals are made to everyone. They are in the booklet that you have received. Tomorrow you will exchange on the first proposal, the one that leads to the source: how to entrust ourselves to God who is mercy? In the parable of Jesus that we read tonight, the son first moves away from his father but then he returns to him, he confides in him and he discovers in his father’s welcome an image of God’s limitless mercy. There is our source. For several years now, there has been an invitation to come to Valencia for a European meeting. A year ago, announcing that it would be possiblethis year, I told the young Spaniards: You are spiritual sons and daughters of Teresa of Avila whose 500th anniversary we are celebrating, and also of John of the Cross. They awoke a mystical life in Spain. Now your generation is called in its turn to light in your country the fire of renewed faith. We like to come to Spain to receive this fire, so that it can burn across Europe. We like to come to Spain to discover the rich diversity of its regions. Thank you to the archbishop, dear Cardinal Cañizares, and to the whole Church of Valencia for welcoming us so well. Now the Cardinal will speak to us and I will say a few words at the end of our prayer. Last night I told you how I spent Christmas in Syria. Before going to Syria, I was in Lebanon. Lebanon is flooded with refugees, almost two million refugees for four million inhabitants. In the Bekaa Valley, we visited makeshift camps. As in Syria, I was impressed by the concern that everyone has for the children. In one of the camps, the refugees themselves have improvised schools, including for the toddlers. Several times I have heard that the education of children was a priority for them. Another priority for them is to live together with their diversity. Lebanon sends us this message: it is possible to live together with different religions. This country is based on mutual respect. Even after trials that have extended as far as civil war, the Lebanese have always returned to this ideal. Let us pray with them so they can continue. Today, it was proposed that each of you should entrust yourself to the mercy of God that will forever remain a springing source. By devoting the next year to seeking how to live mercy, joining thus the year of mercy launched by Pope Francis, we hope to discover that the Church is first of all a community of love and forgiveness. You will deepen that tomorrow morning. Of course, our communities, our parishes, our groups often remain far from what we dream of. But the Holy Spirit is present in the Church and enables us to walk along paths of forgiveness. Mercy and compassion are Gospel values ​​that can be a response to the trials facing our societies; mercy and compassion are capable of defusing the spiral of violence between humans. Many Christians around the world give their lives for reconciliation and peace. In the history of Christians, many martyrs have called to love and forgive. Forgiveness is a word that does not always come to our lips. There are even situations where we cannot forgive. But at least we can entrust to Christ those who do wrong and say, like him when he was on the cross, "Father forgive them, they know not what they do". In order that the Church may become ever more a community of love and reconciliation, we Christians urgently need to find an answer to this question: how to show that unity is possible while respecting pluralism? In oder to advance towards a reconciliation of Christians, it is essential to know each other better, no only in the West but also between the Christians of East and West. That is why, several times, with some brothers and with young people from various countries, we have gone on pilgrimage to Istanbul, Moscow, Minsk, Kiev and Lviv . These pilgrimages have been so positive that in the coming year we will make another such visit, this time in Romania. Patriarch Daniel has agreed that, from 28 April to 1 May 2016, with 150 young people, we can go to participate in the Orthodox Easter celebrations in Bucharest. Do we know that, as Christians, we have a specific gift to prepare ways of peace and trust on earth? We are the Body of Christ and a communion between those who follow Christ can become a credible sign of reconciliation in the midst of humanity. Spending Christmas in Syria, I understood better how trying it is, for the people of that country, to know that the combat zones are never far away. People have grown used to hearing the sound of bombs. I would like to report to you tonight the most powerful words that I heard in Syria. They come from someone young who said, "Say in Europe, tell the Valencia meeting that the majority of people in Syria have always lived and want to continue living together, with different religions." And this young Syrian concluded sadly, "But our voice is not heard. It is the noise of weapons which is loudest." Faced with violence, wherever it occurs, some come to ask: where is God? God is there, he suffers with the victims. It is for us to be witnesses, by compassion and mercy. Sometimes we let ourselves be hypnotized by fear. Resisting fear does not mean that it has to disappear, but that we should not be paralyzed by it. Restored fraternity among humans is the only way to prepare a future of peace. We must not allow the rejection of the other to enter our hearts, because it is the seed of barbarism. Fraternity is the path opened by Jesus, he speaks of it in the parable of the Good Samaritan which we have just read and which is illustrated by the Icon of Mercy we have before us. We Christians together form the visible Church, but we believe that the Gospel creates a wider communion: in the heart of God all humans form one single family. Have we fully accepted the pluralism of this human family? If not, we will not be able to claim a universal fraternity. Tomorrow, you will be searching how to extend mercy to its social dimensions: how to go beyond the fear of the foreigner, beyond differences in cultures, how to help shape the new face that migrations are giving to our societies? By welcoming in Taizé every week young people from every background, animating a "pilgrimage of trust on earth” with meetings on all the continents, we are trying to live this universal fraternity which prepares peace. And at the end of 2016 there will be the 39th European meeting. We have received such a generous welcome in Valencia. I would like to thank the families, the parishes, the church leaders, all those in the administration of the city, of the Valencian Community and the State who have made possible the smooth running of our meeting. I have spoken to you every night about Syria and many wonder: what can we do when confronted with violence? The answer that I heard out there is: what we can do, is to express that God does not want violence, but that God is love. Not only by words but by our lives. 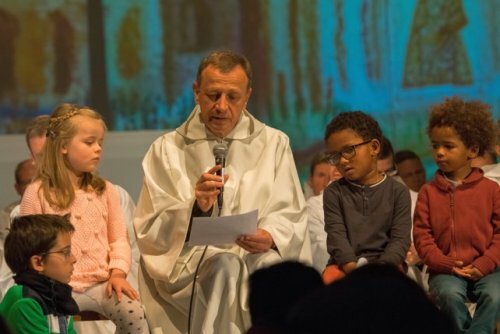 Let us show that the Church is a community of love by being open to those around us, by exercising hospitality, defending the oppressed, sharing what we have. To introduce more fraternity in our societies, signs of hope encourage us. One such sign is given by the initiatives of sharing which are increasingly numerous, for example, with those who know the ordeal of unemployment, or with migrants. In Taizé, we are pleased to have recently been able to install on our hill a Christian family from Iraq. They are here with us in Valencia. We are also hosting eleven young Muslim migrants, from Sudan and Afghanistan. During a meal they told us that they condemned those who use Islam to commit atrocities. Such a simple contact with Muslims changes our outlook. As Christians, we want to discover how God is present also in other religions. And together with them we must affirm that it is impossible to justify violence in the name of God. Another sign of hope: many people realize that fraternity and mercy must extend to our wonderful planet, to all creation. The earth is our common home. Our solidarity with the whole of creation is also a way of seeking peace. The exploitation of the riches of the earth without regard for solidarity with the future generations is injustice and selfishness. Everyone can contribute to a future of peace by sharing, and by choosing for that a sober lifestyle. And let us persevere in prayer for peace. Could we all, each Sunday evening, spend half an hour in silence in a church? Half an hour devoted firstly to entrusting to God the countries and peoples who suffer from violence, and also to welcoming the peace of Christ within us. We hope that our pilgrimage during these days can participate in the construction of Europe with all its wonderful diversity, in this time when doubt risks setting in: a Europe whose peoples are more united with each other, a Europe more in solidarity with other continents. This year we brothers, we would like to live a new sign of solidarity between continents. In February, two brothers will go live in Cuba and form a small fraternity of brotherhood and sharing. I am delighted to announce this here, since Spain has always been close to Cuba. Back at home, we all aspire to be witnesses to peace around us. Let us remember: each of our lives can become a little light of peace that shines in the darkness, even if the flame sometimes seems to be weak and wavering. By his mysterious presence, Christ, the Risen Lord accompanies us. Humbly, he asks us as he asked Peter in the Gospel: "Do you love me?" And like Peter we would like to reply: "You know everything; you know that I love you."